How is surveillance discussed outside the realm of academia? 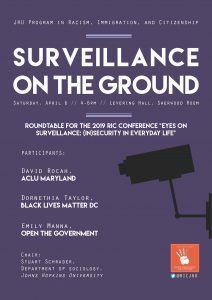 This roundtable brings together Dornethia Taylor from Black Lives Matter DC, David Rocah from the ACLU and Emily Manna from Open the Government to speak about their work on surveillance and how surveillance affects their professions. 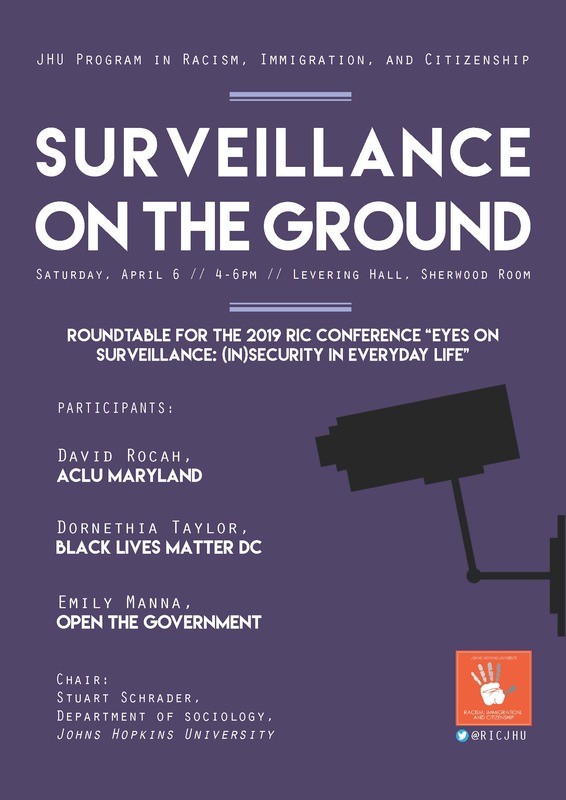 Together they will discuss government surveillance in the United States and abroad; what personal experiences they have had with surveillance in their work; the relationship between surveillance and technology; and the links between surveillance and violence. Stuart Schrader, Sociology, Johns Hopkins University, will chair this panel. He is a scholar of race, policing, and counter-insurgency. His most recent book Badges Without Borders: How Global Counterinsurgency Transformed American Policing looks at the global processes of counterinsurgency and control and its linkages to national forms of policing in the US, revealing the connections between foreign and domestic racial control. Dornethia coordinates the Direct Action Pod within Black Lives Matter DC. She organizes strategic and consistent mobilizations to prevent racist and oppressive abuses. Her work also consists of educating the community on action planning, safety skills, techniques, and rights and laws regarding protesting in DC. In addition, Dornethia is a member of the P.G. County People’s Coalition and P.G. County Community Empowerment Police Accountability Forum (CEPA). She contributes her time and knowledge to help eliminate the underlying culture that promotes police brutality, mass incarceration, school closings and all ills of racist capitalist structures. Her focus is looking for ways to build power collaboratively with marginalized communities and transform oppressive systems in the DMV area. Dornethia holds a B.A. in Business Administration from the University of the District of Columbia. David Rocah is the Senior Staff Attorney for ACLU’s Maryland chapter. He joined their staff in 2001. He has worked on significant cases involving free speech, police misconduct, LGBT rights, privacy, reproductive freedom, immigrants’ rights, election law, and more. In 2009, the Maryland Daily Record selected him as one of Maryland’s “Ten Most Influential Lawyers”. In 2011, he was an inaugural recipient of the James Baldwin Medal for Civil Rights. He previously worked as a Senior Trial Attorney in the Civil Rights Division at the U. S. Department of Justice, where his work focused on police misconduct and conditions in prisons, jails, and other state institutions. Prior to that, David was a staff attorney with the ACLU of New Jersey. David is a 1994 honors graduate of NYU School of Law, where he was a Root-Tilden-Snow Scholar. After law school, David served as a law clerk to U.S. District Judge Barefoot Sanders in Dallas, Texas. He holds a B.A. in philosophy from the University of Chicago. Emily Manna’s policy works centers on transparency and accountability for U.S. military and national security programs, records management and data preservation, and transparency as it relates to immigration and civil liberties policies. Emily also coordinates with coalition members, implementing Open the Government’s programmatic activities. Prior to joining the organization, Emily focused on civil liberties and human rights issues in U.S. national security and foreign policy. She worked in community relations at the Arab American Institute and as a researcher for the American University Ibn Khaldun Chair of Islamic Studies. Emily holds a Masters in Public Policy from Georgetown University, where her research focused on the U.S. drone program, and a B.A. from American University.